The model, Elise, is only 15 years old but still looks younger than her age. This makeup look is very much appropriate for her. I hope I was able to do my best with this look. 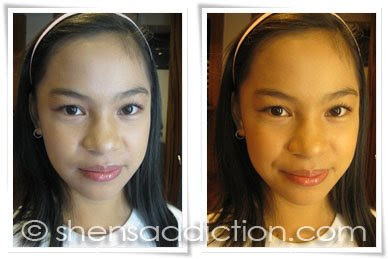 I used a light foundation for her fair skin and little to no concealer because her skin is very clear. I also avoided shaving her brows because of her age, I only touched it up with a brow powder. Contoured her face lightly as per teacher's order. Gave her a soft blush just enough to pop her cheeks. Glossed over some MAC Cremesheen in Melt in your Mouth. The eyes is just a wash of beige eyeshadow all over the lids and soft definition of plum eyeshadow on the outer crease of her eyes. Since she had gorgeous eyelashes, I curled it the best I could (i'm scared of curling someone else's eyelashes). Lastly, I applied mascara to coat her curly lashes. I love how it turned out. She looked so fresh. I planned to do the same for my goddaughter's birthday party on August but with a little dazzling of rhinestones on the side of her face for her themed birthday party.